This beautiful Antique Victorian window is still in its original frame The frame is in good condition. The glass has no chips or scratches and the leading is good. 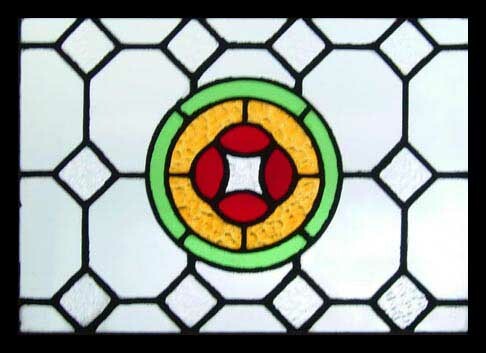 The depth of colour in glass used in this widow has been obtained using methods which are no longer allowed Consequently glass as beautiful as this may never be made again. This is a beautiful piece for any home. Of English origin from around the 1901 mark. Frame 24 1/2 "w x 19 1/4" H Glass 21 1/2" x 15 1/2 " This Antique Window Shipped and packed to USA for.USA $159 Full Insurance You can buy this now using the paypal link below the photograph or e-mail sales click here to arrange payment by personal check ,money order or bank transfer.